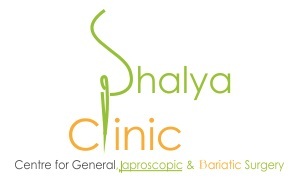 Shalya Clinic is located in Rohini, Sector -8, Delhi. The clinic is visited by Dr. Pankaj Sharma a general, laparoscopic and bariatric surgeon in Delhi. Laparoscopic cholecystectomy for gall bladder stones. Laparoscopic meshplasty for all types of Hernias. Diagnostic Laparoscopy for undiagnosed abdominal pain or chronic diseases or staging of cancers. Doctors are regarded as God, because God relieves us from pain. However, it seems that for a maintaining regular inflow of consulting fees (Rs. 500), the practice is to keep the patient in pain throughout. First --- Laproscopic surgery MUST be done by 'use and throw' instruments. In my case it seems to be just an act of negligence as I developed port infection soon after the surgery. Second --- The doctor said "Science is not magic" and mentioned that such infection cannot be cured in a matter of days. It takes weeks and even months of regular dressing and treatment (Remember, regular consulting fees part)... Hence, my infection was not cured, rather the port was cut multiple times with painful dressing on daily basis for 3 weeks. Third --- Finally took a desperate decision to visit Chennai for treatment in an attempt to live a painless life... Got treated in 3 days by doctors in Ramachandra Medical Hospital, with just papaya (Papita, in hindi) and Zanocin antibiotic, WITHOUT ANY KIND DRESSING. The infection dried itself while being exposed to natural air, right food and medicine... Yes, it was that easy!!! Not sure if any more review comments are required. Warm and human. My sister had a severe heart pain six months back. Since then he, I mean Dr. Pankaj Sharma had been taking care of her. Not only that she has recovered from the frequent pains , she had developed an affinity and trust in this doctor. He has been able to diagnose her ailments and the secondary problems as well. Yesterday we had gine just for a checkup and everything was recorded normal. I found him to be prompt, efficient and confident. His amiable nature can make even the sick feel better. Experience with doctor is so nice....he explained the problem in very good manner...no confusion at all.everything is clear.actually one says something and another says something but he explained the actual problem . another doctor suggested surgery but he says no need for surgery.v r satisfied.